Image of Neptune taken by Voyager 2 in 1989. For the Roman god Neptune please click here. Neptune is the eighth and farthest planet from the Sun in our solar system. It is the fourth largest planet by diameter and the third largest by mass. It is 17 times the mass of Earth and slightly more massive than its near twin Uranus (which is 14 Earth Masses), but it is slightly smaller than Uranus due to its higher density. The planet is named after the Roman god of the sea. Its astronomical symbol ( ) is a stylized version of Poseidon's Trident. Neptune's atmosphere is primarily composed of hydrogen and helium, with traces of methane that account for the planet's blue appearance. Its blue color is much more vivid than that of Uranus, which has a similar amount of methane, so an unknown component is presumed to cause Neptune's intense color. Neptune also has the strongest winds of any planet in the solar system, measured to be as high as 2,100 kilometers per hour or 1,300 miles per hour. At the time of the 1989 Voyager 2 flyby, it had in its southern hemisphere a Great Dark Spot comparable to the Great Red Spot on Jupiter. Neptune's temperature at its cloud tops is usually close to −210 °C (−346 °F), one of the coldest in the solar system, due to its long distance from the sun. Neptune's center is about 7,000 °C (13,000 °F), however—hotter than the surface of the sun. This is due to extremely hot gases and rock in the center. Faint azure-colored rings have been detected around the blue planet, but are much less substantial than those of Saturn. When these rings were discovered by a team led by Edward Guinan, it was thought that they might not be complete. However, this was disproven by Voyager 2. Neptune possesses 13 confirmed moons. Neptune's largest moon, Triton, is notable for its retrograde orbit, extreme cold (38 K), and extremely tenuous (14 microbar) nitrogen/methane atmosphere. Discovered on September 23, 1846, Neptune is notable for being the first planet discovered based on mathematical prediction rather than regular observations. Perturbations in the orbit of Uranus led astronomers to deduce Neptune's existence. It has been visited by only one spacecraft, Voyager 2, which flew by the planet on August 25, 1989. In 2003, there was a proposal to NASA's "Vision Missions Studies" to implement a "Neptune Orbiter with Probes" mission that does Cassini-level science without fission-based electric power or propulsion. The work is being done in conjunction with Jet Propulsion Laboratory (JPL) and the California Institute of Technology. A portion of the dwarf planet Pluto's highly eccentric orbit brings it nearer to the Sun than Neptune, which has a nearly circular orbit. As a result, for approximately 13 to 20 years out of the every 248 (Pluto's orbital period), Neptune lies farther from the Sun than Pluto. The most recent occurrence of this phenomenon began February 7, 1979, and ended February 11, 1999. Galileo's astronomical drawings show that he had first observed Neptune on December 28, 1612, and again on January 27, 1613; on both occasions, Galileo had mistaken Neptune for a fixed star when it appeared very close (in conjunction) to Jupiter in the night sky. Believing it to be a fixed star, he cannot be credited with its discovery. At the time of his first observation in December 1612, because it was only beginning its yearly retrograde cycle, Neptune's motion was far too slight to be detected with Galileo's small telescope. In 1821 Alexis Bouvard published astronomical tables of the orbit of Uranus. Subsequent observations revealed substantial deviations from the tables, leading Bouvard to hypothesize some perturbing body. In 1843 John Couch Adams calculated the orbit of an eighth planet that would account for Uranus' motion. He sent his calculations to Sir George Airy, the Astronomer Royal, who asked Adams for a clarification. Adams began to draft a reply but never sent it. In 1846, Urbain Le Verrier, independently of Adams, produced his own calculations but also experienced difficulties in encouraging any enthusiasm in his compatriots. However, in the same year, John Herschel started to champion the mathematical approach and persuaded James Challis to search for the planet. After much procrastination, Challis began his reluctant search in July 1846. However, in the meantime Le Verrier had convinced Johann Gottfried Galle to search for the planet. Though still a student at the Berlin Observatory, Heinrich d'Arrest suggested that a recently drawn chart of the sky, in the region of Le Verrier's predicted location, could be compared with the current sky to seek the displacement characteristic of a planet, as opposed to a fixed star. Neptune was discovered that very night, September 23, 1846, within one degree of where Le Verrier had predicted it to be, and about 10 degrees from Adams' prediction. Challis later realized that he had observed the planet twice in August and had failed to identify it, owing to his casual approach to the work. In the wake of the discovery, there was much nationalistic rivalry between the French and the British over who had priority and deserved credit for the discovery. Eventually an international consensus emerged that both Le Verrier and Adams jointly deserved credit. However, the issue is now being re-evaluated by historians with the rediscovery in 1998 of the "Neptune papers" (historical documents from the Royal Greenwich Observatory), which had apparently been misappropriated by astronomer Olin Eggen for nearly three decades and were only rediscovered (in his possession) immediately after his death. After reviewing the documents, some historians now suggest that Adams does not deserve equal credit with Le Verrier. Shortly after its discovery, Neptune was referred to simply as "the planet exterior to Uranus" or as "Le Verrier's planet." The first suggestion for a name came from Galle. He proposed the name “Janus.” In England, Challis put forth the name “Oceanus,” particularly appropriate for a seafaring people. In France, Arago suggested that the new planet be called Leverrier, a suggestion which was met with stiff resistance outside France. French almanacs promptly reintroduced the name Herschel for Uranus and Leverrier for the new planet. 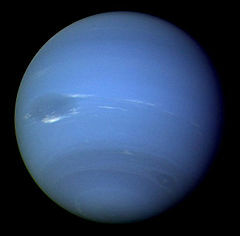 Meanwhile, on separate and independent occasions, Adams suggested altering the name Georgian to Uranus, while Leverrier (through the Board of Longitude) suggested Neptune for the new planet. Struve came out in favor of that name on December 29, 1846, to the Saint Petersburg Academy of Sciences. Soon Neptune became the internationally accepted nomenclature. In Roman mythology, Neptune was the god of the sea, identified with the Greek Poseidon. The demand for a mythological name seemed to be in keeping with the nomenclature of the other planets, all of which, except for Uranus, were named in antiquity. The planet's name is translated literally as the “sea king star” in Chinese, Korean, Japanese, and Vietnamese languages. In India the name given to the planet is Varuna, the god of the sea in Vedic/Hindu mythology, the equivalent of Poseidon/Neptune in the Greco-Roman mythology. At 1.0243×1026 kilograms, Neptune is an intermediate body between Earth and the largest gas giants: it is seventeen Earth masses but just one-eighteenth the mass of Jupiter. It and Uranus are often considered a sub-class of gas giant termed "ice giants," given their smaller size and important differences in composition relative to Jupiter and Saturn. In the search for extra-solar planets, Neptune has been used as a metonym: discovered bodies of similar mass are often referred to as "Neptunes" just as astronomers refer to various extra-solar "Jupiters." Orbiting so far from the sun, Neptune receives very little heat with the uppermost regions of the atmosphere at −218 °C (55 K). Deeper inside the layers of gas, however, the temperature rises steadily. As with Uranus, the source of this heating is unknown, but the discrepancy is larger: Neptune is the farthest planet from the Sun, yet its internal energy is sufficient to drive the fastest winds seen in the solar system. Several possible explanations have been suggested, including radiogenic heating from the planet's core, the continued radiation into space of leftover heat generated by infalling matter during the planet's birth, and gravity wave breaking above the tropopause. The internal structure resembles that of Uranus. There is likely to be a core consisting of molten rock and metal, surrounded by a mixture of rock, water, ammonia, and methane. The atmosphere, extending perhaps 10 to 20 percent of the way towards the center, is mostly hydrogen and helium at high altitudes (80 percent and 19 percent, respectively). Increasing concentrations of methane, ammonia, and water are found in the lower regions of the atmosphere. Gradually this darker and hotter area blends into the superheated liquid interior. The pressure at the center of Neptune is millions of times more than that on the surface of Earth. Comparing its rotational speed to its degree of oblateness indicates that it has its mass less concentrated towards the center than does Uranus. Neptune also resembles Uranus in its magnetosphere, with a magnetic field strongly tilted relative to its rotational axis at 47 degrees and offset at least 0.55 radii (about 13,500 kilometers) from the planet's physical center. Comparing the magnetic fields of the two planets, scientists think the extreme orientation may be characteristic of flows in the interior of the planet and not the result of Uranus' sideways orientation. One difference between Neptune and Uranus is the level of meteorological activity. Uranus is visually quite bland, while Neptune's high winds come with notable weather phenomena. Neptune's atmosphere has the highest wind speeds in the solar system, thought to be powered by the flow of internal heat, and its weather is characterized by extremely violent hurricanes, with winds reaching up to around 2,100 kilometers per hour, near-supersonic speeds. Even more typical winds in the banded equatorial region can possess speeds of around 1,200 kilometers per hour (750 miles per hour). In 1989, the “Great Dark Spot,” a cyclonic storm system the size of Eurasia, was discovered by NASA's Voyager 2 spacecraft. The storm resembled the Great Red Spot of Jupiter. However, on November 2, 1994, the Hubble Space Telescope did not see the Great Dark Spot on the planet. Instead, a new storm similar to the Great Dark Spot was found in the planet's northern hemisphere. The reason for the Great Dark Spot's disappearance is unknown. One possible theory is that heat transfer from the planet's core disrupted the atmospheric equilibrium and disrupted existing circulation patterns. The “Scooter” is another storm described as a white cloud south of the Great Dark Spot. “The Wizard's eye” (Great Dark Spot 2) is a southern hurricane, the second-most intensive hurricane known to exist on the planet. Unique among the gas giants is the presence of high clouds casting shadows on the opaque cloud deck below. 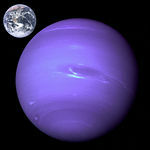 Though Neptune's atmosphere is much more dynamic than that of Uranus, both planets are made of the same gases and ices. Uranus and Neptune are not strictly gas giants similar to Jupiter and Saturn, but are rather ice giants, meaning they have a larger solid core and are also made of ices. 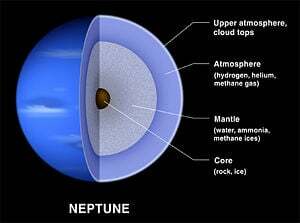 Neptune is very cold, with temperatures as low as -224 °C (-372 °F or 49 K) recorded at the cloud tops in 1989. The closest approach of Voyager 2 to Neptune occurred on August 25, 1989. Since this was the last major planet the spacecraft could visit, it was decided to make a close flyby of the moon Triton, regardless of the consequences to the trajectory, similarly to what was done for Voyager 1's encounter with Saturn and its moon Titan. The probe also discovered the Great Dark Spot, which has since disappeared, according to Hubble Space Telescope observations. Originally thought to be a large cloud itself, it was later postulated to be a hole in the visible cloud deck. Neptune turned out to have the strongest winds of all the solar system's gas giants. In the outer regions of the solar system, where the Sun shines over one thousand times fainter than on Earth (still very bright with a magnitude of -21), the last of the four giants defied all expectations of the scientists. One might expect that the farther one gets from The Sun, the less energy there would be to drive the winds around. The winds on Jupiter were already hundreds of kilometers per hour. Rather than seeing slower winds, the scientists found faster winds (over 1,600 kilometers per hour) on more distant Neptune. One suggested cause for this apparent anomaly is that if enough energy is produced, turbulence is created, which slows the winds down (like those of Jupiter). On Neptune, however, there is so little solar energy that once winds are started they probably meet very little resistance, and are able to maintain extremely high velocities. Nonetheless, Neptune radiates more energy than it receives from the Sun, and the internal energy source of these winds remains undetermined. Neptune has a faint planetary ring system of unknown composition. The rings have a peculiar "clumpy" structure, the cause of which is not currently understood but which may be due to the gravitational interaction with small moons in orbit near them. Evidence that the rings are incomplete first arose in the mid-1980s, when stellar occultation experiments were found to occasionally show an extra "blink" just before or after the planet occulted the star. Images by Voyager 2 in 1989 settled the issue, when the ring system was found to contain several faint rings. The outermost ring, Adams, contains three prominent arcs now named Liberté, Egalité, and Fraternité (Liberty, Equality, and Fraternity). The existence of arcs is very difficult to understand because the laws of motion would predict that arcs spread out into a uniform ring over very short timescales. The gravitational effects of Galatea, a moon just inward from the ring, are now believed to confine the arcs. 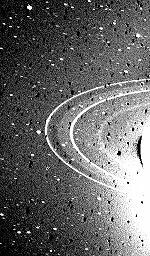 Several other rings were detected by the Voyager cameras. In addition to the narrow Adams Ring 63,000 kilometers from the centre of Neptune, the Leverrier Ring is at 53,000 kilometers and the broader, fainter Galle Ring is at 42,000 kilometers. A faint outward extension to the Leverrier Ring has been named Lassell; it is bounded at its outer edge by the Arago Ring at 57,000 kilometers. New Earth-based observations announced in 2005 appeared to show that Neptune's rings are much more unstable than previously thought. In particular, it seems that the Liberté ring might disappear in as little as one century. The new observations appear to throw our understanding of Neptune's rings into considerable confusion. Neptune has 13 known moons. The largest by far, and the only one massive enough to be spheroidal, is Triton, discovered by William Lassell just 17 days after the discovery of Neptune itself. Unlike all other large planetary moons, Triton has a retrograde orbit, indicating that it was captured, and probably represents a large example of a Kuiper Belt object (although clearly no longer in the Kuiper Belt). It is close enough to Neptune to be locked into a synchronous orbit, and is slowly spiraling inward and eventually will be torn apart when it reaches the Roche limit. Triton is the coldest object that has been measured in the solar system, with temperatures of 38.15K (-235 °C, -392 °F). Neptune's second known satellite (by order of distance), the irregular moon Nereid, has one of the most eccentric orbits of any satellite in the solar system. From July to September 1989, Voyager 2 discovered six new Neptunian moons. Of these, the irregularly shaped Proteus is notable for being as large as a body of its density can be without being pulled into a spherical shape by its own gravity. Although the second most massive Neptunian moon, it is only one quarter of one percent of the mass of Triton. Neptune's innermost four moons, Naiad, Thalassa, Despina, and Galatea, orbit close enough to be within Neptune's rings. The next farthest out, Larissa was originally discovered in 1981 when it had occulted a star. This was attributed to ring arcs, but when Voyager 2 observed Neptune in 1989, it was found to have been caused by the moon. Five new irregular moons discovered between 2002 and 2003 were announced in 2004. As Neptune was the Roman god of the sea, the planet's moons have been named after lesser sea gods. Neptune is never visible with the naked eye, having a brightness between magnitudes +7.7 and +8.0, which can be outshone by Jupiter's Galilean moons, the dwarf planet Ceres and the asteroids 4 Vesta, 2 Pallas, 7 Iris, 3 Juno, and 6 Hebe. A telescope or strong binoculars will resolve Neptune as a small blue-green disk, similar in appearance to Uranus; the blue-green color comes from the methane in its atmosphere. Its small apparent size has made it almost impossible to study visually; even observatory data was fairly poor until the advent of adaptive optics. With an orbital period (sidereal period) of 164.88 Julian years, Neptune will soon return (for the first time since its discovery) to the same position in the sky where it was discovered in 1846. This will happen three different times, along with a fourth in which it will come very close to being at that position. These are April 11, 2009, when it will be in prograde motion; July 17, 2009, when it will be in retrograde motion; and February 7, 2010, when it will be in prograde motion. It will also come very close to being at the point of the 1846 discovery in late October through early-mid November 2010, when Neptune will switch from retrograde to direct motion on the exact degree of Neptune's discovery and will then be stationary along the ecliptic within two arc minutes at that point (closest on November 7, 2010). This will be the last time for approximately the next 165 years that Neptune will be at its point of discovery. This is explained by the concept of retrogradation. Like all planets and asteroids in the solar system beyond Earth, Neptune undergoes retrogradation at certain points during its synodic period. In addition to the start of retrogradation, other events within the synodic period include astronomical opposition, the return to prograde motion, and conjunction to the Sun. ↑ Munsell, K. (2007). Solar System Exploration: Neptune. NASA. Retrieved March 21, 2007. ↑ Suomi, V. E., S. S.Limaye and D. R. Johnson (1991). High winds of Neptune - A possible mechanism. Science 251: 929-932. Retrieved March 21, 2007. ↑ Spilker, T. R., and A. P. Ingersoll (2004). 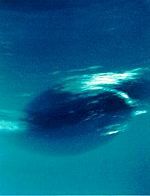 Outstanding Science in the Neptune System From an Aerocaptured Vision Mission. American Astronomical Society, 36th DPS Meeting, Session 14 Future Missions. Retrieved June 4, 2007. ↑ Bouvard, A. (1821) Tables astronomiques publiées par le Bureau des Longitudes de France. Paris: Bachelier. Retrieved June 4, 2007. ↑ Sheehan, W., N. Kollerstrom and C. B. Waff (2004). “The Case of the Pilfered Planet: Did the British Steal Neptune?” Scientific American (December 2004). Retrieved June 4, 2007. ↑ "Trio of Neptunes." Astrobiology Magazine (May 21, 2006). Retrieved June 4, 2007. ↑ McHugh, J. P. “Computation of Gravity Waves near the Tropopause.” AAS/Division for Planetary Sciences Meeting Abstracts (September 1999): 53.07. ↑ McHugh, J. P. and A. J. Friedson. “Neptune's Energy Crisis: Gravity Wave Heating of the Stratosphere of Neptune.” Bulletin of the American Astronomical Society (September 1996):1078. ↑ Hammel, H. B. et al (1989). Neptune's wind speeds obtained by tracking clouds in Voyager images. Science 245: 1367-1369. Retrieved June 4, 2007. ↑ Beebe R. (1992). The clouds and winds of Neptune. Planetary Report 12: 18-21. Retrieved June 4, 2007. ↑ Gazetteer of Planetary Nomenclature Ring and Ring Gap Nomenclature. USGS - Astrogeology Research Program (2004). Retrieved June 4, 2007. ↑ Neptune's rings are fading away. New Scientist (2005). Retrieved June 4, 2007. ↑ Holman, M. J. et al. (2004). Discovery of five irregular moons of Neptune. Nature 430: 865-867. ↑ Five new moons for planet Neptune. BBC News (2004). Retrieved June 4, 2007. Adams, J. C. 1846. “Explanation of the observed irregularities in the motion of Uranus, on the hypothesis of disturbance by a more distant planet.” Monthly Notices of the Royal Astronomical Society 7: 149. Retrieved March 21, 2007. Airy, G. B. 1846. “Account of some circumstances historically connected with the discovery of the planet exterior to Uranus.” Monthly Notices of the Royal Astronomical Society 7: 121-144. Retrieved March 21, 2007. Challis, J., Rev. 1846. “Account of observations at the Cambridge observatory for detecting the planet exterior to Uranus.” Monthly Notices of the Royal Astronomical Society 7: 145-149. Retrieved March 21, 2007. Galle, J. G. November 1846. “Account of the discovery of Le Verrier's planet Neptune, at Berlin, Sept. 23, 1846.” Monthly Notices of the Royal Astronomical Society 7: 153. Retrieved March 21, 2007. Lunine, J. I. 1993. “The Atmospheres of Uranus and Neptune.” Annual Review of Astronomy and Astrophysics 31: 217-263. Smith, B. A. 2004. Neptune. World Book @ NASA. Retrieved March 21, 2007. Neptune Fact Sheet – NASA. List of Neptune Trojans – Minor Planet Center, Smithsonian Astrophysical Observatory. “Mission to Neptune Under Study.” Universe Today. This page was last modified on 15 November 2018, at 23:43.